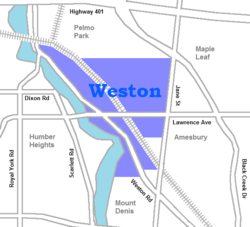 Weston is a neighbourhood and former village in Toronto, Ontario, Canada. The neighbourhood is situated in the northwest of the city, south of Highway 401, east of the Humber River, north of Eglinton Avenue, and west of Jane Street. Weston Road just north of Lawrence Avenue is the commercial core of Weston, with many small businesses and services. Weston was incorporated as a village in the 19th century and was absorbed into the Borough of York in the late 1960s. York itself was amalgamated into Toronto in 1998. Weston consists of Victorian-era homes east of the railway, and apartments Weston Road. Weston's building stock consists mostly of Victorian homes east of the railway with apartment and condominium towers on Weston Road overlooking the Humber River valley. Weston's main shopping district is located on Weston Road between Church Street in the north and Wilby Crescent (just south of Lawrence Avenue) in the south. Most buildings in this area reflect early-mid-20th century Ontario town architecture, brick buildings with decorative masonry. The area has a noteworthy library (previously a Mechanics' Institute and Carnegie library). The community is dotted with grand old churches with architectural significance. There has been a recent move in Weston to designate certain areas as a historical district. Most streets in Weston are lined with tall mature trees, some well over 100 years old. This is more common east of the railway tracks. Recently,[when?] there has been some infill development on former industrial and commercial lands bringing some new housing stock to the area. On April 26, 2013, a fire was accidentally started at 2304 Weston Road, due to tar during roof construction. The first European settlement in the Weston area took place in the 1790s, when a saw mill was built in Etobicoke Township on an old native trading path along the west side of the Humber River, named after the well-known Humber estuary in Yorkshire, England. In 1815 James Farr, a prominent local mill owner, named the growing settlement "Weston" after his birthplace, Weston, Hertfordshire. Weston initially developed along both sides of the river until a disastrous flood in 1850 destroyed the west bank settlement. The former west bank settlement is now the site of the Weston Golf and Country Club. Improvements to the Main Street, now Weston Road, and the 1856 arrival of the Grand Trunk Railway brought growth on the east side. The first post office was opened in 1842. The first library opened in 1858, a Mechanic's Institute. In 1865, the Trinity College School opened, founded by William Arthur Johnson. It was located in Weston near the old Mill and at a home further north until 1867. It relocated to Port Hope, Ontario in 1868. In 1869, Prince Arthur, Duke of Connaught and Strathearn visited Weston to attend the sod turning ceremony for the construction of the Toronto, Grey and Bruce Railway. A second railway company arrived in 1869. On October 5, 1869, Prince Arthur, Duke of Connaught and Strathearn attended the sod turning ceremony for the construction of the Toronto, Grey and Bruce Railway. The spade which he used for the event is kept in the public library. The town of Weston grew, and over the 19th century became an important industrial centre for the Toronto area. The symbol adopted for the town, an outline of an old-fashioned bicycle, was based on this history of manufacturing and especially the old CCM bicycle factory on Lawrence Avenue just east of Weston Road. Models of bicycles now hang from the streetlights along Weston Road. The Weston Branch of the Toronto Public Library. The building was erected as a Carnegie library in 1914. Weston was incorporated as a village in 1881, and then as a town in 1914. In 1914, the town also saw the opening of Weston Public Library, a Carnegie library. This building is now recognized with heritage status. 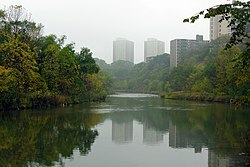 In October 1954, Hurricane Hazel flooded the Humber River valley, causing death and destruction of property. In response, low-lying areas in the Humber River valley were converted to parkland and property zoning standards were changed across Ontario to avoid building encroachment on floodplains. There is a memorial in the south end of Lions Park near a pedestrian bridge which incorporates the original footing of a bridge that once crossed the Humber. The other footing of the bridge is the square chunk of concrete that is in the middle of the river nearby. In 1967, it became part of the Borough (later City) of York. 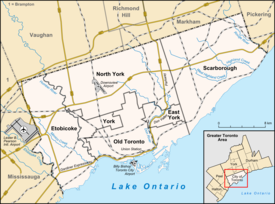 In 1998, York was in turn amalgamated with the five other members of Metropolitan Toronto, (Toronto, Etobicoke, North York, East York, and Scarborough) in the new "megacity" of Toronto. Vocal lobbying at the time allowed Weston to retain many street names which are exact duplicates of downtown streets, including Church Street, King Street and John Street. The Union Pearson Express between Toronto Pearson International Airport and Union Station downtown was a hot political issue in Weston. It had originally been proposed for completion by 2009. Weston is currently a station stop on the Kitchener line operated by GO Transit and additional airport trains would stop there. The link would see the construction of three additional tracks through the neighbourhood and increased rail traffic more than fourfold. Community activists worried about how the link would sever the community (vehicle traffic on one street will be permanently blocked from crossing the tracks, replaced by a pedestrian bridge) and the possibility of lower future property values due to increased noise and diesel fumes. Union Pearson Express train at Weston GO Station. Worries that the airport rail link's tracks would bisect the community eventually led to the tracks going into a trench, with bridges overhead to prevent the bisecting. It was an issue during the Canadian federal election held on January 23, 2006, when incumbent Liberal Member of Parliament, Alan Tonks, supported the link, while the other candidates opposed it. It was also an issue in the February 2007 provincial by-election, where all local candidates came out against the link, but which was still supported by the governing Liberals. The Weston Community Coalition (WCC) had proposed a subway line as an alternative to run through the Weston rail corridor to the airport that would have stops along the way which would serve many communities throughout Toronto and be operated by the TTC rather than a private company. Various other alternatives were presented by community activists such as an Eglinton subway to the airport, an LRT alternative, or a route down Highway 427. In the end, the tracks went into a trench with bridges overhead to prevent bisecting the neighbourhood. A "rail deck park" allowed the expansion of a Toronto Catholic school playground over the tracks. In 2016, the Weston neighbourhood was home to 17,992 residents. 60% of the population speak English as their first language, 6.4% speak Spanish, 4.8% speak Portuguese, 4.3% speak Somali and 3.1% speak Italian. The 89 Weston Toronto Transit Commission bus along Weston Road. The 89 Weston is one of several bus routes that passes through Weston. Weston falls within the service area of the Toronto Transit Commission (TTC). Transit is provided entirely by buses linking to the subway system. The 32 Eglinton West, 35 Jane, 52 Lawrence, 59 Maple Leaf, 73 Royal York, 79 Scarlett, and 89 Weston all pass through the boundaries of Weston. As of January 2012, all TTC bus routes serving Weston are accessible. Routes 52 and 352 were the final TTC bus routes to be made accessible, with the retirement of the last GMC New Look "Fishbowl" buses in December 2011. Although all bus routes are accessible, individual stops along the routes may not meet accessibility standards. The Metrolinx Weston GO Station is located at Weston Road and Lawrence Avenue. The station is served by the Kitchener line (which connects Kitchener, Ontario to downtown Toronto during rush hours) and the Union Pearson Express (all-day service between Toronto Pearson International Airport and downtown Toronto). The Weston GO Station is wheelchair accessible. The Weston Farmers' Market opens weekly from mid-May to the end of October near the centre of Weston. The Weston BIA also hosts a Harvest Festival around Thanksgiving in October, and the Weston Santa Claus Parade each November. View of the Humber River footbridge south of Lawrence Avenue. Weston has a number of small parks along the Humber River Valley. Weston has many small parks throughout but most notable is Cruickshank Park in the Humber River valley with many mature trees and paved bicycle paths lined with large weeping willow trees. The bicycle path continues south to Lake Ontario. Sometimes salmon can be seen swimming upstream in the river. The park has a population of beaver as can be seen from the tell-tale marks left behind on trees. In order to protect some trees, park staff have wrapped the tree trunks with wire screen in some areas. There are also some frogs closer to the water's edge and garter snakes hidden away in the more secluded areas. Canada geese, loons, mallards and seagulls are a common sight. Herons have also been spotted looking for fish in the river. In some areas of the park, you can see exposed sedimentary rock in the walls of the valley, made visible by the action of glaciers that carved out the valley during the last glacial period about 20,000 years ago. The same rock was used to build many stone retaining walls throughout the town; an example of this use can be seen on the south end of the Lawrence Avenue bridge in the north end of Lions Park. Weston Lions Park, located south of Lawrence Avenue, fills 22.13 acres (89,600 m2) and contains facilities for playing football, rugby union, soccer, tennis, and baseball, as well as an ice rink, swimming pool, basketball court and skatepark. Originally as Weston Arena, it is now known as either Weston Lions Arena or Weston Lions Recreation Arena. The arena was proposed on what was the Weston Fairgrounds in 1944, opened in 1949 and a pool was added in 1959. The arena hosted the Toronto Dixie Beehives of the Ontario Junior Hockey League from 2007 to 2009. The mayor and council sat at Weston Town Hall (Dufferin Hall) at corner of Little Avenue and Weston Road (since demolished and now a parking lot). The 1980s children's TV series The Edison Twins was filmed and set in Weston. Drake mentions Weston in his 2018 hit single "God's Plan" and has a feature song "Weston Road Flows" on his 2016 album "Views"
^ "Weston 2006 Social Profile #1" (PDF). City of Toronto. Retrieved 2008-08-28. ^ "Weston neighbourhood profile". Toronto Neighbourhood Maps. City of Toronto. Retrieved 2008-08-27. ^ Heritage Conservation Districts – Weston. City of Toronto. Accessed 2008-08-21. ^ a b "About Weston". WestonPlace.ca. Retrieved 2008-08-27. ^ a b Remembering Hurricane Hazel. Environment Canada website. Accessed 2008-08-21. ^ Keenan, Edward (14 October 2016). "Weston's Raildeck Park was Always on the Right Track". Toronto Star. Retrieved 26 June 2017. ^ Kurek, Dominik (2 November 2016). "Toronto gets a rail deck park - in Weston". Inside Toronto. Metroland Media Group. Retrieved 26 June 2017. ^ "Weston neighbourhood profile" (PDF). City of Toronto. Retrieved 2018-11-21. ^ "32 Eglinton West". Bus Routes. Toronto Transit Commission. Retrieved 2008-08-27. ^ "35 Jane". Bus Routes. Toronto Transit Commission. Retrieved 2008-08-27. ^ "52 Lawrence". Bus Routes. Toronto Transit Commission. Retrieved 2008-08-27. ^ "59 Maple Leaf". Bus Routes. Toronto Transit Commission. Retrieved 2008-08-27. ^ "73 Royal York". Bus Routes. Toronto Transit Commission. Retrieved 2008-08-27. ^ "79 Scarlett". Bus Routes. Toronto Transit Commission. Retrieved 2008-08-27. ^ "89 Weston". Bus Routes. Toronto Transit Commission. Retrieved 2008-08-27. ^ "Accessible Transit Network map" (PDF). TTC website. Retrieved 2012-01-15. ^ Weston Farmers' Market. Accessed 2008-08-21. ^ Weston Village BIA. Accessed 2008-08-21. ^ Toronto Parks & Trails Map 2001. Accessed 2008-08-27. Wikimedia Commons has media related to Weston, Toronto.